For years there was a tradition of live jazz and blues in Austin, long before any of the current downtown venues ever existed. And there was a tradition of Huston Tillotson music students sharpening their chops at jam sessions at the Victory Grill and Charlies' Playhouse, historically significant East 11th Street music venues. 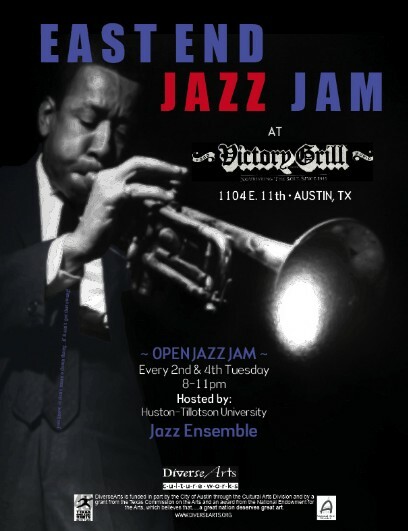 With the City of Austin's recent designations of the East Austin Cultural Heritage District and Live Music District, your friends at the DiverseArts, Victory Grill, Bemba Entertainment, and the Huston Tillotson Jazz Program are partnering to make sure that we begin efforts to re-establish East 11th Street as a destination for live jazz, blues, R&B, world music, gospel and hip hop. We have more programming to roll out as we move into summer, but for now we are getting the ball rolling by putting in place East Austin's first regularly scheduled jazz jam in years.